Looking for good quality used cars in Blackburn? Then look no further than Globe Motors Blackburn for a great selection of second hand cars in Blackburn at very affordable prices. We are used car specialists offering a range of quality used cars from leading manufacturers including Audi, BMW, Citroen, Fiat, Ford, Honda, Kia, Mazda, Mini, Nissan, Peugeot, Renault, Seat, Skoda, Toyota, Vauxhall, Volkswagen and Volvo. Our wide selection of used cars are all economically priced from around £1,000 up to £50,000 and with diesel, petrol, manual and automatic models ready to drive away, we are sure to have the ideal used car for you. View our current range in our online used car showroom. 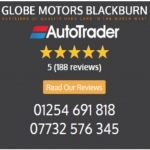 At Globe Motors Blackburn we take care and pride to ensure that the car you buy from us has been checked to a high standard using industry standard HPI checking systems and so all our vehicles are HPI checked, so that you can have peace of mind when you buy from us. Not only that, we offer a 3 month RAC backed extendable warranty as standard on all our vehicle sold. We also offer a Used Car Part Exchange service, allowing customers to cover part of the cost of their new car by trading in their old one. We check our prices regularly so you can be assured of getting the best possible deal available. If you're wanting to sell your existing car outright then we can help as We Buy Cars for Cash. We pay great prices for used cars in good condition. Simply fill in our valuation form and let us give you an idea of what we would be prepared to offer you. Conveniently located on Hart Street in Blackburn, close to Blackburn Town Centre and easily accessible from major motorway networks, 5 minutes away from junction 5 or 6 off the M65, for customers visiting by car from Blackburn and the surrounding areas of Preston, Chorley, Accrington, Clitheroe, Burnley and Bolton.